Introducing the new Tennant T17 battery powered ride on floor scrubber, manufactured in the U.S. With durability and quality coming first, this machine is built to last in the roughest of environments. This machine will not only increase productivity, but will enhance the image of your facility by contributing to a more clean and safe environment. 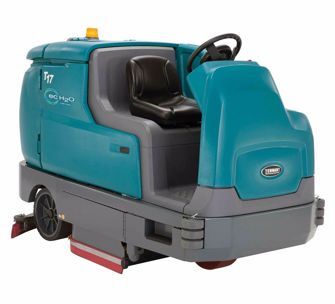 The T17 delivers high quality cleaning results on numerous hard surfaced floors. Easily maintain polished floors or scrub away ground in dirt in a fraction of the time it takes when implementing other cleaning methods. With the single button scrub operation feature, training is kept simple; simply push the start button and go.